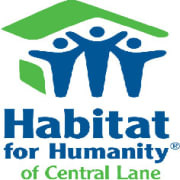 Habitat for Humanity, of Central Lane was founded in 1990 as an affiliate of Habitat for Humanity International. We are deeply committed to the belief that all God’s people deserve a decent, affordable place to live. Working with individuals and families, volunteers and dedicated supporters, we build homes, communities and hope. With our home construction program, low-income families invest in their future with a lot of hard work or "sweat equity." Families complete a minimum of 300-500 "sweat equity" hours (depending on family configuration) prior to moving in. After the house is built with volunteers, our families purchase their home with a low-interest, no-profit loan. Their monthly mortgage payments cycle directly back into the mission of Habitat, allowing us to provide the same life-changing experience for another family. Each Partner Family receives continued support through education and mentorship. We also take great pride in the preservation of our existing community neighborhoods. Our Home Repair program, A Brush With Kindness, works with low-income veterans, elderly and/or disabled homeowners in need of minor exterior home repairs. By bringing these homes back to a decent, livable standard, our families are able to stay at home in a comfortable, safe, familiar environment. Would you recommend Habitat for Humanity of Central Lane? Volunteering at Habitat for Humanity has given me the opportunity to learn all phases of home construction. After my experiences on the build site, I feel confident to do most any project around my own house! It was also great to meet amazing groups of fellow volunteers. Everyone is so kind and dedicated to the cause! Where else can you find a work environment where everyone WANTS to be there?